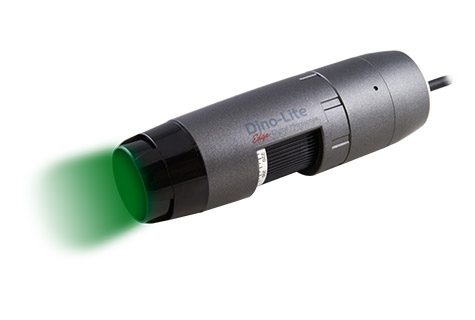 The image quality obtained with the Dino-Lite is comparable or superior to some traditional fluorescence microscope, but much less to obtain and maintain. It is equipped with a 1.3 Megapixels sensor and utilizes a rotatable magnification dial that allows magnification up to 220X depending of working distance, a scroll lock feature for assuring desired set magnification/ focus distance, and a cable strain relief (SR) that holds the Dino-Lite and its USB Cable together for resistance from pulls and twists. There is also a white light switchable by included software for aid in focus and location. The Dino-Lite EDGE AM4115T-YFGW provides a valuable price per performance tool for researchers or users interested in observing orange to red fluorescent specimens.